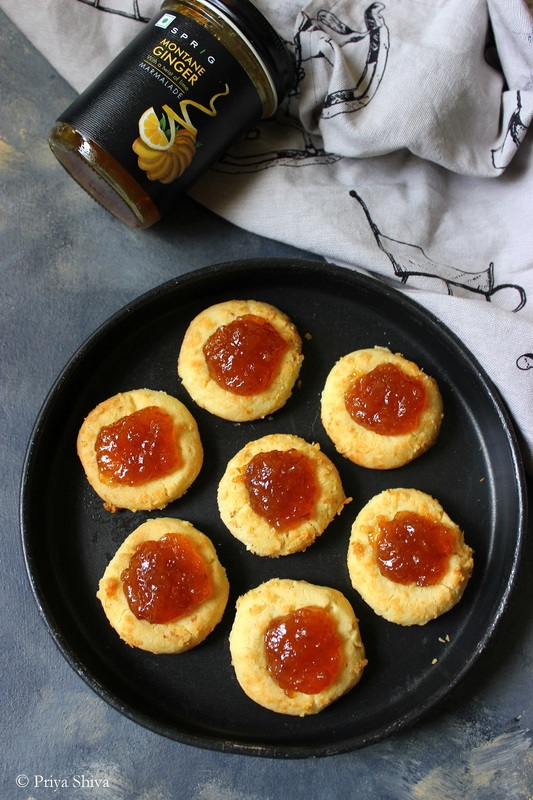 I love baking cookies and thumbprint cookies with jam or marmalade is one of my favorite. 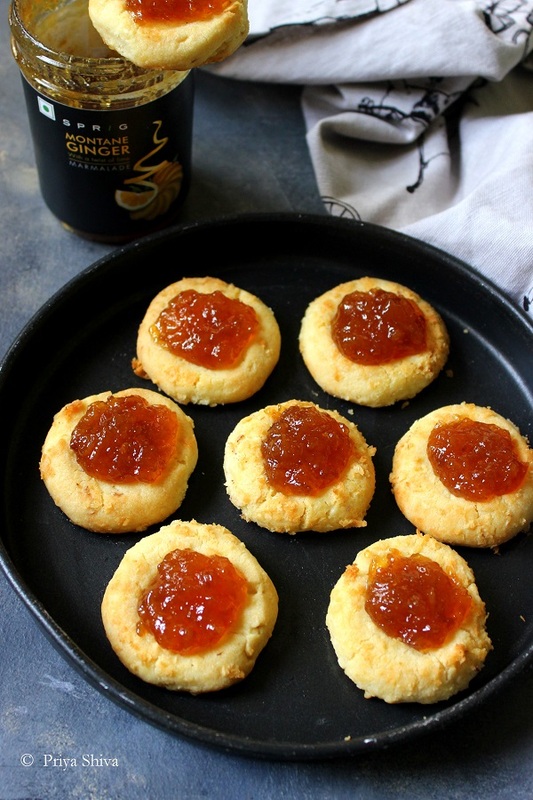 So, I decided to bake these Ginger Marmalade Coconut Thumbprint Cookies today. The cookies turned out to be so good that I had to share the recipe with you all.. I love sprig products and you will remember the caramel pancakes and Dulce De Leche Ice cream recipe which I shared earlier using their product. Sprig has recently launched Ginger Marmalade with a twist of lime in it and it is simply mind blowing! The marmalade is made with young, tender gingers and it has an added freshness from green limes. These cookies turned out to be so good only because of the delicious Ginger marmalade by Sprig. You can also enjoy their products and guess what? Use coupon “PRIYAKITCHENETTE” to place your order and the first 10 lucky people will be able to redeem a 15% discount on sprig website. You can buy as many jars as you want. So, click here to place your order now! 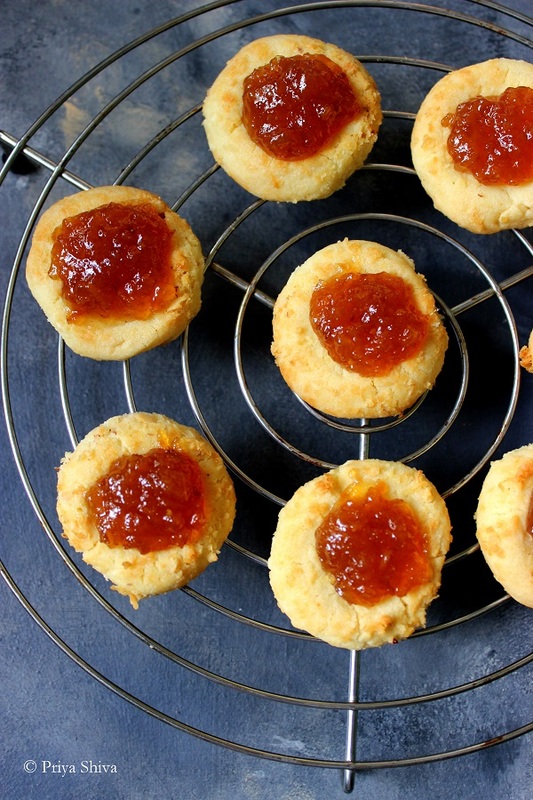 So, coming back to today’s recipe for Ginger Marmalade Coconut Thumbprint Cookies.. These cookies are loaded with ginger marmalade with a twist of lime. These cookies are heavenly with coconut in it. It is so easy to make that even you kids can help you. So, check out the recipe and enjoy these cookies with your favorite beverage. Add butter, vanilla essence and sugar in a bowl and beat it well till its fluffy. Now add all purpose flour, salt and combine. You can 2 tbsp milk if you feel the dough is very stiff. Refrigerate the dough for 30 minutes. Take a small portion of dough, make a small ball of it, roll it in shredded coconut and flatten it gently with your thumb in the center of the cookie and place it on cookie tray. Keep at least 1/2 inch distance between each cookie. 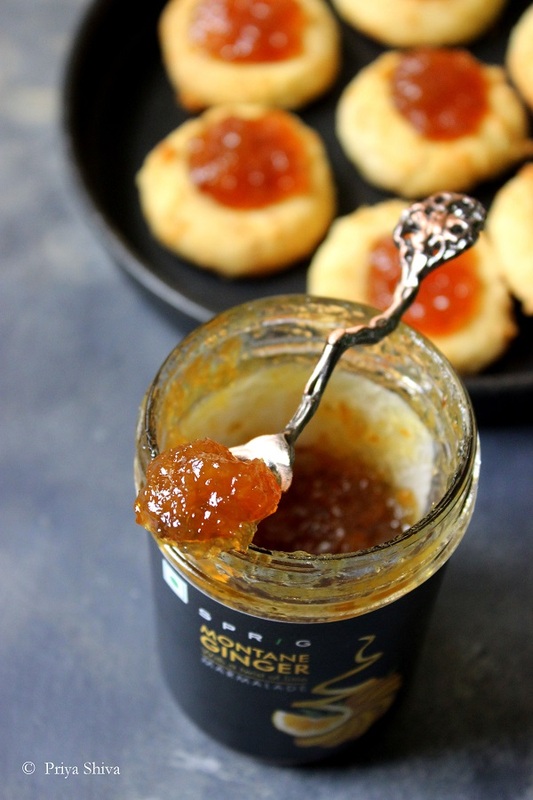 Top the cookies with ginger marmalade when the cookies are warm itself. When they have cooled down completely, enjoy them with your favorite beverage. My cookies took 18 minutes. [br]Make sure the butter is at room temperature. I’m loving these cookies! The marmalade sounds fantastic! I have a special weakness for coconut cookies. It’s one of my favorite flavors and when you top it with jam, well, I’m ALL IN! I need to make these soon! Oh these cookies look so delicious, love this recipe! How pretty! Love the ginger flavor, these look like so much fun to make and eat! Ginger is a flavour that you can enjoy all year round. These look perfect for my afternoon latte break.